Enjoy coffee-shop beverages right at home without all of the special equipment. I recently posted this recipe on Instagram and wanted to share it will you all as well. Combine preferred amount of milk, maple syrup, and vanilla in a glass jar fitted with a lid (make sure the lid is on tight). Shake milk for 45-60 seconds until foamy and doubled in volume. Remove lid and microwave on high for 30 seconds. 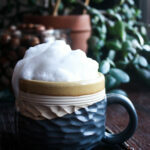 Add coffee or espresso to a large mug and pour milk over coffee, holding back foam with a spoon. Once you’ve added as much milk as you would like, spoon foam over top of coffee and enjoy! Can you substitute for almond or oat milk? Hi Jamie! You could definitely substitute with either of those, you just won’t get as much foam. The lack of foam will be due to the lower protein content of both milks compared to that of cows milk. Although I love the flavor and creaminess of almond milk, I might give oat milk a try first, it has a bit more protein than almond milk! I’d love to hear how it turns out!